The name roots in dwfn, deep, or profound. 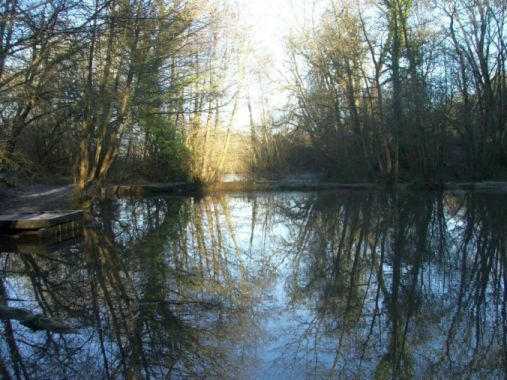 Pool of Annwfn, Jan. 2011 by John Davies. Annwfn is an idealised image of this world, a mirror reality where all is idealised. It is can be interpreted as a remote part of Dyfed, as somewhere in Ireland, an island in the ocean, or as an alternate reality in mystical terms. In the First Branch prince Pwyll goes to Annwfn for a year and after that, there is a close association between his own land of Dyfed, and Annwfn. So he is ever after called Penn Annwfn, the chief or lord of Annwfn. In Preiddau Annwfn, Arthur leads an raiding expedition to Annwfn to reive the magical Cauldron. The magical or mystical events in the Mabinogi tales are often attributed to Annwfn influence. The Cauldron which revives dead warriors is linked with Annwfn. Annwfn pigs gifted to Pryderi are superior to any other pigs, but they lead to his doom. Other animals associated with Annwfn are described as dazzling white, and the Hounds of Annwfn met in the First Branch also have brilliant scarlet ears. The people of Annwfn live in luxury, feasting and hunting in an endless leisurely pursuit of pleasure. The people there are impressively courteous and cultured, and all is done in an orderly way, as it should be. The style of government is just, as Pwyll discovers in his visit there. Annwfn has its kings and two are named in the First Branch, Arawn and Hafgan, who have a long standing feud. Other rulers are Gwyn ap Nudd who emerges from a hill, that is, under the earth, and his father Nudd. Arawn too has associations of underground in his name, and the hill of Arberth, Gorssedd Arberth, is the gateway or initiator of enchantments in the First and Third Branches. The people of Annwfn and the people of this world meet each other, converse, bargain, marry and fight. But unlike Greek Olympus, people here can go there, as well as Annwfn people coming here. Unlike Hades or Hell, visitors can return. The transition does not appear to be complicated for those that can do it. It is spoken of in simple terms as if passing into another room or crossing a river. It can be seen as a mystical transition between two dimensions, or a physical crossing between neighbouring lands. The ‘Underworld’ is an accurate equivalent of Annwfn in terms of language, reflecting the root dwfn, deep or profound. However this is problematic because it suggests the Greek Hades, or the Christian Hel; and Annwfn is not like either of these. The ‘Otherworld’ is also commonly used to translate Annwfn. This does suggest the way Annwfn is always close, and how it weaves with ordinary reality, but it fails to capture its nature as profound depth. It is perhaps best to not translate the name as it is a unique meaning. The nature of Annwfn is not clearcut, which suggests a tradition of somewhere other, which differs according to local views or the needs of a tale. An ultimately Celtic reality.